Keeping fish as pet is something I've done for the past few years. Most recently, I've had an aquarium of freshwater fish for a few years. My last fish in that tank was Rasby the Rasbora, who lived for a few years. I had hoped to write this post about him and upgrade his fish tank, but he unfortunately passed away before I had the chance. This post is sponsored by MARS Fishcare and the BlogPaws Professional Pet Blogger Network. I am being compensated for helping spread the word about API Perfect Start but Pawsitively Pets only shares information we feel is relevant to our readers. MARS Fishcare is not responsible for the content of this article. 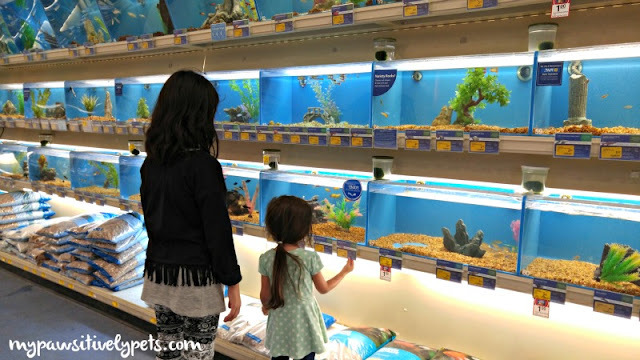 My daughters both love keeping fish, especially my youngest - the 3 year old. She loves watching her fish swim around their fish tank. I thought it was time to get rid of our old fish tank and start anew. This time with a new type of freshwater fish - a Betta. It's been a very long time since I've kept a Betta as a pet. In their natural habitat, they live in small rice paddy puddles, so they don't require a huge tank. Still, something a comfortable size is nice. Betta fish are aggressive towards each other, and must be kept alone. Off I went to PetSmart with my two girls. I wasn't even sure what kind of fish I was going to get this time. I love them all! I decided to go with a Betta because they are an easy fish to keep. Finally, we decided on a deep red colored male Betta with blue eyes. He has some blue mixed in on his body too which is hard to capture in a photo. Photos really cannot capture just how beautiful he is! At my oldest daughter's request, we've named him "Blaze". The API Perfect Start pouches that are included with the API Fishcare Aquarium Kit I purchased help get the water ready for the fish to live in. 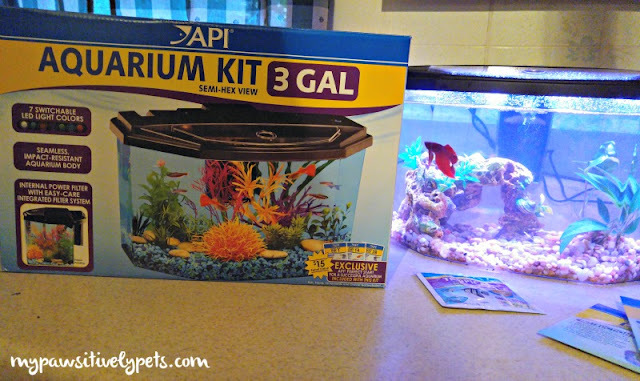 They come with easy to follow instructions and take the guesswork out of what you need to make sure you're ready for your fish to live in his new home. And they help you keep a healthy fish tank for the first 4 weeks. Just remember that you have to get the water up to room temperature before adding any fish into the aquarium. Another reason why I love our new API Fishcare Aquarium is the light. I feel Blaze the Betta is having a dance party in that thing. Seriously - it is way too cool. There are 7 amazing LED light colors you can select from and it looks nice. My favorite colors are white and yellow, for their more natural look. But there's also, blue, green, purple, and red. I can even have the colors alternate and change every few seconds. Check out the video below to see what I mean. And I am loving this Betta fish too. Blaze has such personality, which I know might be hard to imagine for a fish. He swims fast and seems excited when he sees me. I'm also teaching him how to do a trick, because apparently you can do that with a Betta fish. He's doing really with his training and I'll have to share it with you all later. Callie the Calico seems to find him quite entertaining as well. If you are looking for an easy start aquarium for a Betta fish or even tropical freshwater fish, we recommend visiting PetSmart and checking out the API Fishcare Aquarium Kits they have available. You can also shop for API Fishcare products online HERE. You can visit API Fishcare on Facebook to stay up to date with them. They are also having an aquarium giveaway on Facebook. Just CLICK HERE to enter! 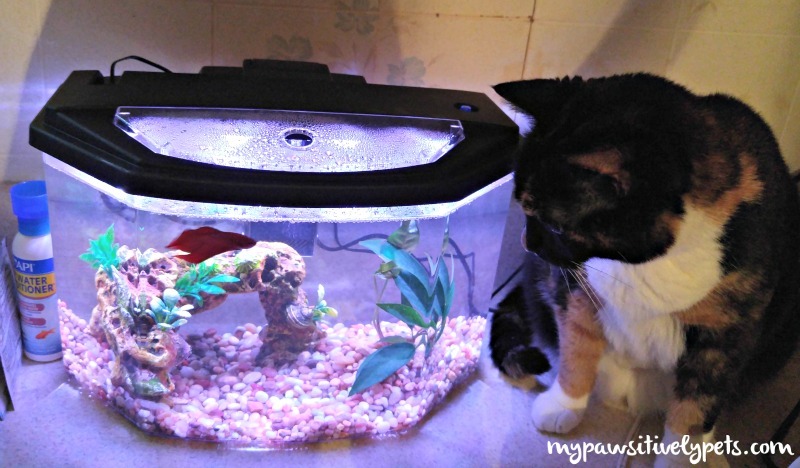 Have you ever kept fish as pets before? Tell us about them in the comments! Please tell me you have a heater! Considering it was over 80 degrees inside my home yesterday, his tank temperature is good for now. But, I will be picking one up for Winter. Yep and Callie really likes it! She may be more used to it now, because I don't see her pawing the tank as much anymore. I could watch that all day long! I love Betta fish! You've got a great name for your fish and a great setup, too. I will have to look into these aquariums when I decide to get another fish - Carmine loved watching our old one swim around! Dang, those things sure are pretty! Meow Dat's pawsum. We used to have a betta fish. Hims name was Funder. he wuld come over to da edge and talk wiff me and sis Lexi. He actually scared mommy once when she heatd him poppin' at us. but we luvved him. and then...mommy sed hims went to heaven, but weez sure we saw him in da toilet. Mommy keeps purromissin' to get us anuvver one but we don't have an aquarium and da vase Funder was in got bwoke durin' our pawrtment remodel. Have fun wiff Blaze, he's sure purretty. 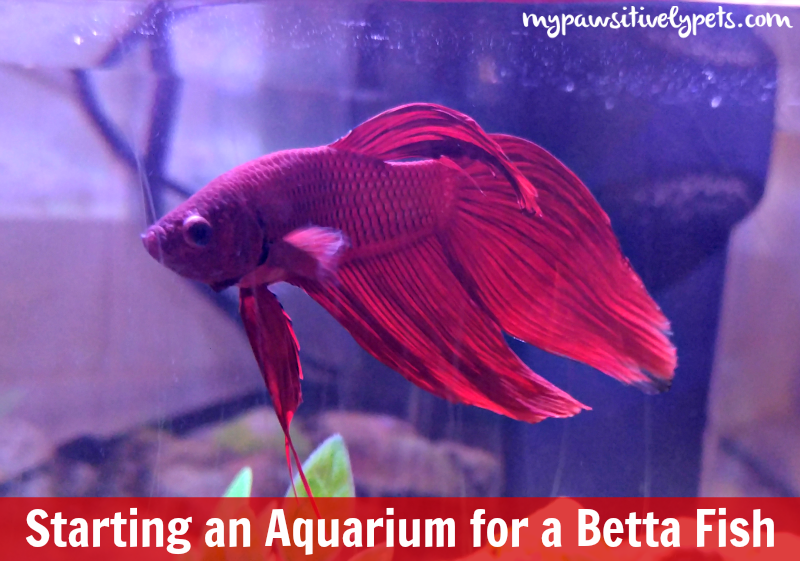 I think a betta could be a great classroom pet. Pretty low maintenance and it seems like this fish has more personality than any of the other fish I've ever had. I love goldfish, but this betta just seems so intelligent. It's quite interesting. We just got a new betta fish at the office recently. He's a lot more spunky than our last one, our previous fish would let you pet him. Our new one hates everyone, lol. Lol! This one is very spunky. Haven't tried to pet him... I wonder what he would think of that. Blaze is beautiful! We used to keep fish many years ago, but we always seemed to have issues with them dying, so we kind of gave up. The funniest thing I remember is one fish that kept jumping out of the tank! Luckily we always found him (before the cats) and got him back in there safely. Thank you! I had a fish like that too actually. A few years ago when I had our outdoor fish pond, I had a goldfish named Magikarp that kept jumping out of the pond... I found him on the ground one day and thought he was dead but nope! I put him in a quarantine bowl for a little while to make sure he was OK.